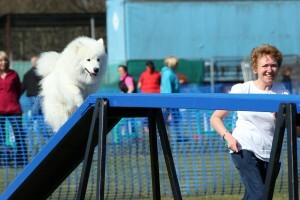 Agility is the fastest growing canine sport in the UK. It is great fun for everyone (dogs and owners), whether you want to participate “just for fun” or whether you have the world championships in your sights! It’s also a great way to keep fit – for both owners and dogs. Ability to work with distractions around – i.e other dogs! The best place to start looking for a club in your area is on agilitynet (www.agilitynet.com). There are over 600 Kennel Club registered clubs. Many independent trainers offer classes as well – either in groups or for individuals. You will find some of these on agilitynet or you could ask at your training classes if anyone does agility and can recommend clubs. As with all dog training you will need to make sure you are happy with the club before you join so go and watch before you decide to sign up. You should ensure that positive reward based training methods are used. You may also wish to consider what experience the instructors have in training a variety of breeds. Some clubs are very competitive and may have mainly border collies whilst others will have a mixture of breeds and a mixture of experience. Just remember that samoyeds can be quite independent and may not approach agility in the same way as border collie who may be quite obsessive about it. You will need to make sure the trainers understand that. When you finally get to the agility lessons you will start with a beginners course . This usually last 8-10 weeks and you and your dog will be taught how to handle each piece of equipment and will start to do some mini courses of two to five obstacles. After the beginners course you will progress to do doing more obstacles in a sequence. However in order to train a dog and handler to competition standard usually takes around 9 months to a year.Your instructors will advise you when they think you are ready to start entering agility shows. Schedules for shows are found on agilitynet. You will also be awarded time faults if you go over the time set for the course. If you gain 15 faults in a round you are eliminated. Most shows offer places and rosettes to 10% of the entry plus clear round rosettes. So you can achieve a rosette for successfully completing the course without any faults – an achievement in itself. There are a number of types of agility show in the UK and the rules differ slightly between them. The largest are KC shows but there are also UKA shows and BAA shows plus numerous unaffiliated shows. At KC shows you will run in classes according to the height of your dog and your grade (based on previous wins). Classes will therefore be for small, medium or large dogs and for Grade 1, 2 , 3 etc.Samoyeds will run in large classes which are by far the biggest numerically. Before entering your first show you will need to have your dog measured by an official measurer and the size will need to be recorded in your dog’s KC agility record book. Jumps are set at 650mm high for large dogs . Unless you have previously done agility and “won out” you will start in Grade 1. However if someone else competes with your dog for you and have won into a higher grade your dog will start at a higher grade based on the handler’s grade. In order to progress from grade 1 to grade 2 you need to win 1 agility class or 3 jumping classes. 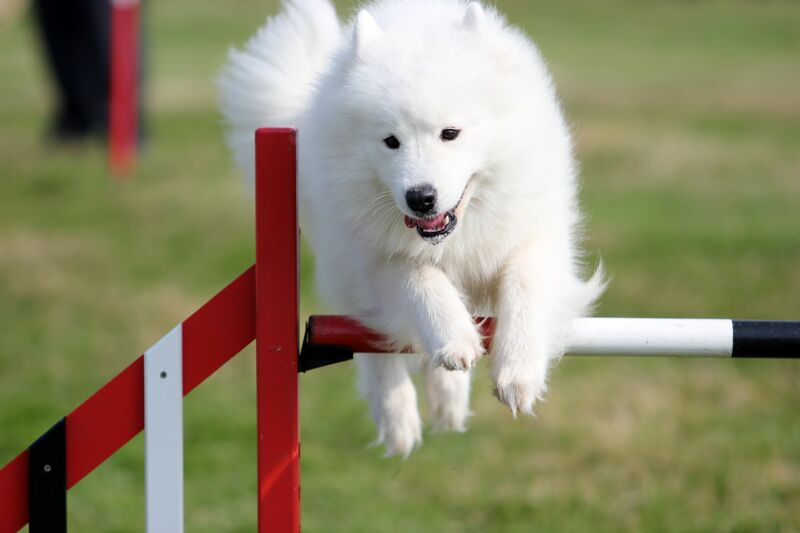 Agility classes are those with the contact equipment included (A frame , dog walk and seesaw) and jumping classes don’t have contact equipment included. Entries at KC shows are high. For large dogs there may be over 200 dogs in a grade 1 to 2 class .This reflects the large number of border collies which still tend to dominate the sport. KC classes often have combined grade classes – such as agility combined grades 1 -3. These are for all dogs in grades 1 to 3 inclusive. There are also ABC classes (Anything But a Collie) . The major difference with UKA shows is(www.ukagility.com ) that they have 4 height categories. They have a standard height of 550mm between medium and large and some samoyeds will measure into this category. Again you will need to have your dog officially measured before you first compete and the height recorded in a UKA record book. UKA offer measuring at most of their shows. They have slightly different rules for progression as well in that you progress to the next level based on points. Points are awarded for each place gained and for clear rounds as well so it is possible to progress on clear rounds alone. There are also many unaffiliated shows which tend to be based on KC rules but they may differ slightly. The rules for any show are always explained fully in the schedules. Agility shows are a great way to get to know people from other clubs. The camaraderie amongst agility folk is great with everyone supporting everyone else when they are running. Many of the summer shows run over 2 days and lots of people camp at the showground for the weekend with friends so it becomes a great social occasion for dogs and owners alike. Many people start in agility for a bit of fun – but once the bug bites your weekends will never be the same!